I’ve just got back to Dorset, from the annual Societies Convention in London, with an award for my maternity photography. To say I’m over the moon would be an understatement! Every January, I go along to the Societies of Photographers’ event. As a member, it’s one of the key events in my diary every year. I love the event because I get to meet up with fellow photographers from across the world. And there’s the chance to attend training workshops with amazingly talented photographers and have your work professionally judged. This year, I submitted a maternity portrait in the print competition, and am thrilled to have been awarded a Merit. Every year, competition is extremely tough. Entries are received from of thousands of photographers from across the UK and beyond. So, it’s an absolutely brilliant feeling to have received recognition in this highly competitive competition and have the print displayed in a top London hotel for the duration of the convention. I chose to put this portrait of the lovely Ashley forward for judging this time because I just loved everything about the image. The composition, the posing, the lighting – everything worked out perfectly, just how I had planned. And, how stunning does she look? That bump?! Just beautiful. The image was enhanced even further thanks to the help of my wonderful mentor Damian McGillicuddy and partner Lesley McGillicuddy. Their guidance and support, and invaluable expertise with the printing really made the portrait shine! My studio and outdoor maternity sessions have always been extremely popular. But winning this award has given me really valuable encouragement to continue creating these beautiful portraits for my pregnant clients. 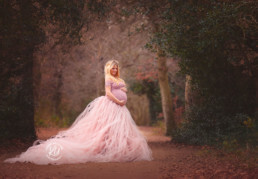 If you’re interested in booking a maternity session with an award-winning maternity photographer, do get in touch. They are a great way to celebrate your pregnancy. Even if you don’t feel it, you look absolutely gorgeous in those final weeks of your pregnancy. Plus, I can make you look and feel even more amazing in my stunning range of designer maternity dresses. Or, we can keep it simple – just you and your beautiful bump! 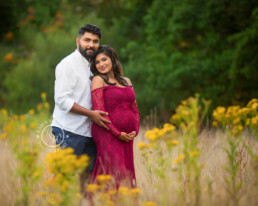 Studio maternity session or outdoor maternity session – the choice is yours! Maternity photoshoots are available all year round and I can tailor the session completely to your preferences. You may have a favourite local location where you want to be photographed, and if so, fine! We can go out at any time of year, whether to the forest, the beach or anywhere else you have in mind across Dorset or Hampshire. 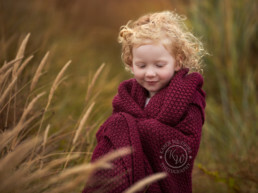 Just last week, in early January, I took this beautiful image of Laine on location. Or you may have a particular colour scheme in mind? Perhaps you want a coloured dress to complement the décor of a room at home? Just let me know and I can create exactly what you’d like.